I press Ctrl+F and I search for something. Once I find it, I press Esc, I make my correction, and then press Ctrl+F to find the next instance. However, the “Find:” text box has different text populated now and I have to scroll in order to find the text I searched originally. Is there anyway to make it stick to the latest searched text? 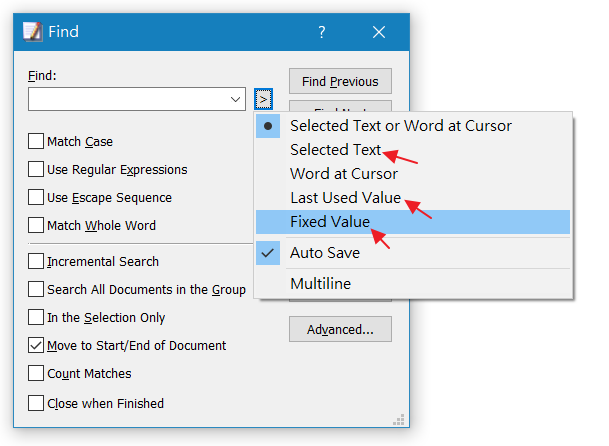 In Find dialog, Click > button, try to use “Selected Text” or “Last Used Value” or “Fixed Value”. Default setting is “Selected Text or Word at Cursor”.